In the next few days, I am teaming up with Please Don't Tell Shop to show you several spring looks. 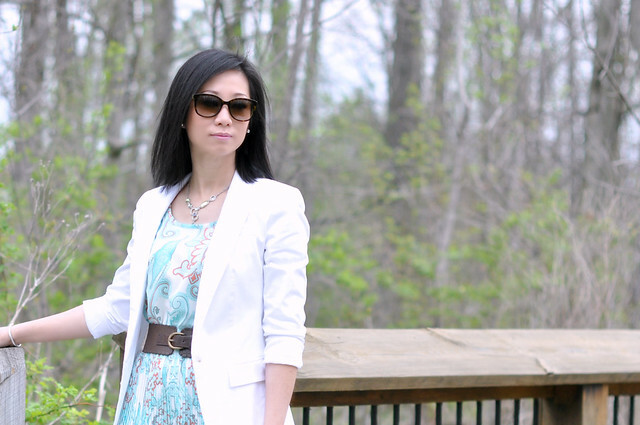 For the first look, I am paring this cute little mint dress with a white blazer. The combo feels so fresh and is perfect for Spring. This outfit is great for an outdoor lunch. I am wearing a size S here and the fit is true to size. It comes with a removable waist tie but I decided to wear a different belt. If you're interested in this dress or any items from PDT shop, use code SFDLOVE20 for 20% off everything site wide. I hope you enjoy the look and stay tuned for more spring outfits early next week. Awesome and classy outfit. Thankyou.